After the success of the One World shows in Hull for it’s City of Culture year, Helen is now bringing One World to London. 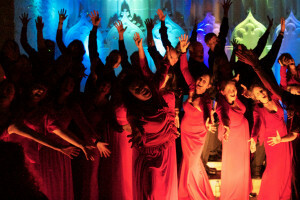 The show is a carefully-crafted tapestry of song and spoken word, illuminating the crossroads at which we stand today. The narrative moves through themes including wealth and resources, our relationship with the natural world, the human and economic cost of warfare and our potential for positive change. 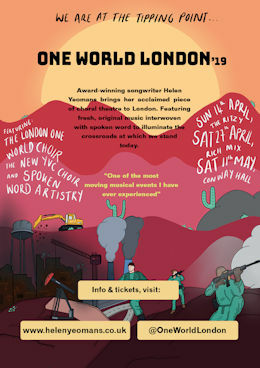 The music is sung by the London One World Choir and singers from the New YVC choir; spoken word is by Vanessa Kisuule, Luke Miller & Cheryl Moskowitz who have all written new pieces specially for the show. 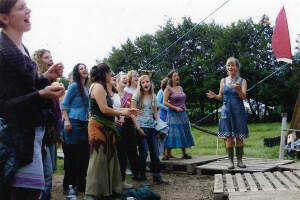 Featuring some of Helen’s best-loved songs including Stronger, Earth Blessing, Unto This Land and Fat Cat, this is a powerful and moving production. For further information, visit the One World Page. 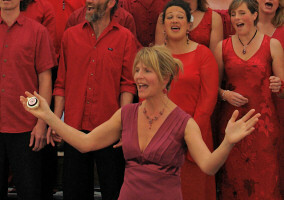 All of Helen’s best-loved choir songs are now available to download on the CD and Downloads Page. So just choose your favourite tunes and download in seconds, for just 79p each! There is a sample of every song to listen to. Her albums are all downloadable as well. Click here to go straight to the page. 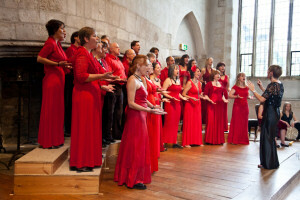 Glorious Chorus is now embarking on it’s Spring/Summer 2019 season, preparing a new repertoire of exciting music. This year the choir is collaborating with acclaimed BBC Radio 2-nominated folk duo Ninebarrow for a couple of concerts in June & July. 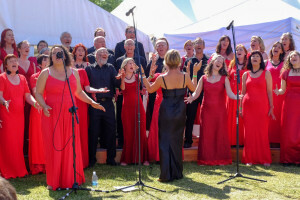 With the summer diary already filling up with other events and festivals, this looks set to be another fabulous year for Glorious Chorus. 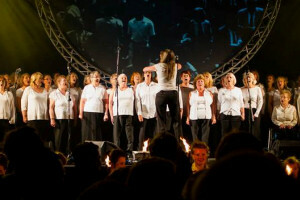 If you’re interested in joining or booking the choir please email Helen. 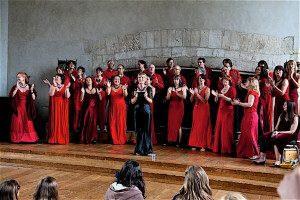 All info about Glorious Chorus can be found at www.gloriouschorus.co.uk. 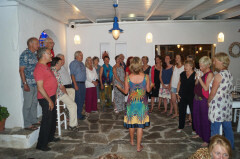 Helen had a wonderfully successful Harmony Magic singing holiday last spring on the beautiful island of Paros, Greece. The holiday will run again this Whitsun from Thurs 23rd to Thurs 30th May’19. 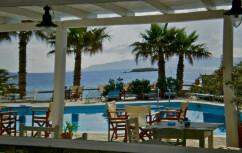 Early booking is advised as this holiday is proving increasingly popular. 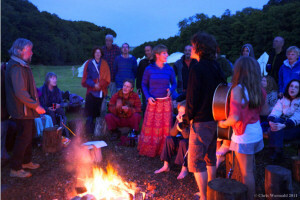 For information about the holiday and to book, please visit the Camps/Holidays Page. 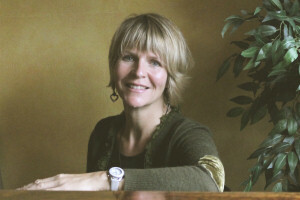 Helen will be concentrating on her One World project in London until May ’19. After that she will be teaching in Greece followed by voice camps in the summer. These are listed to the right, on the ‘Upcoming Events’ section. 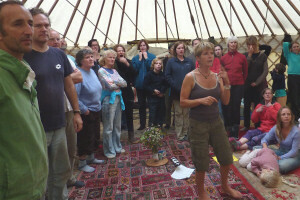 Workshops after that time will be listed on this site and also announced in Helen’s newsletters, which you can subscribe to at the ‘Mailing List’ section at the top right of this page. 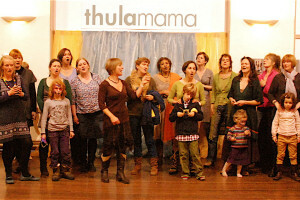 See the Thula Mama Page for a beautiful video of the mums singing with their babies – all you need to prove that singing works! Click to mute audio before playing video. The song playing is Helen's original song 'Fat Cat' which is one of the songs in the forthcoming One World shows in London. 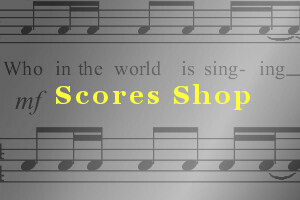 The score is available to buy: All Helen's original songs & arrangements can be found on the Scores Page. Helen was interviewed by BBC Spotlight TV programme about her win and you can see this clip on the Helen’s Story Page. 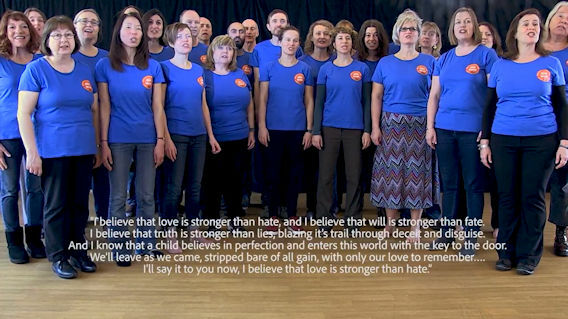 You can watch the choir performing 'Saved' here (right) with Fran Andre on lead vocal. The score for the song can be purchased on the Scores Page and the song is also featured on the Love, Peace & Harmony album on the CDs Page. This space is dedicated to acapella songs by other writers. Click below to hear Helen Chadwick’s haunting song ‘Longing’ from her latest album ‘Fragments Of Love' and visit the Links Page to read more. 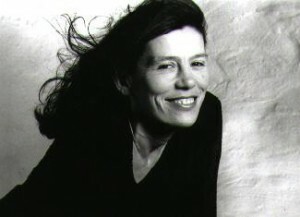 For all information about Helen, visit www.helenchadwick.com.